CHARLOTTE, N.C. -- Although Hurricane Matthew is no longer a threat, the devastation it created continues to be felt by thousands of people in the Southeast. Duke Energy today announced a donation of $325,000 to help seven charities providing disaster relief assistance in several of the states it serves – North Carolina, South Carolina and Florida. "While the men and women of Duke Energy have worked nonstop to restore power to customers in Florida and the Carolinas, we know our communities need more," said Lynn Good, chairman, president and CEO. "Disaster relief agencies are on the front lines helping families and communities recover and rebuild. We are glad to make this contribution to help support that good work." Duke Energy is donating $100,000 to the Red Cross in North Carolina. Additionally, Piedmont Natural Gas is giving $25,000. Both donations will go to disaster relief efforts in the state, including supporting more than 60 shelters the nonprofit has opened in the eastern region to provide refuge for North Carolinians affected by Hurricane Matthew. "This financial support is instrumental in providing relief to the communities ravaged by Hurricane Matthew," said Tony Jeffreys, regional chief development officer, Red Cross Eastern North Carolina Region. "Duke Energy and Piedmont consistently step up to aid Red Cross relief efforts in the wake of natural disasters. We are grateful for their continued partnership." Three organizations will receive donation assistance in South Carolina, totaling $100,000. Duke Energy is donating $50,000 to the One SC Fund, which was established by Gov. Nikki Haley in November 2015 after flooding affected South Carolinians across the state. The fund is supporting nonprofit organizations providing relief and recovery assistance to those affected by Hurricane Matthew. 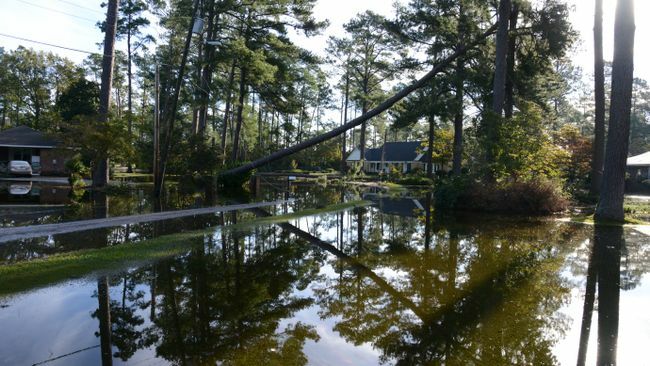 Red Cross South Carolina Region will receive $25,000 to help disaster relief efforts in the Pee Dee region in the northeast area of the state. Harvest Hope Food Bank will receive $25,000, which will help increase the number of mobile food pantries available to individuals and families in the Pee Dee region who have been affected by the storm. "Hundreds of people have experienced enormous losses to their homes and belongings due to Hurricane Matthew, and additional flooding is expected," said Denise Holland, CEO of Harvest Hope. "The gift from Duke Energy gives me confidence that we can respond quickly to provide needed food supplies to families in the Pee Dee area." Three organizations will receive donation assistance in Florida, totaling $100,000. Duke Energy will donate $50,000 to United Way of Volusia-Flagler Counties, both of which were significantly affected by the hurricane. The Hispanic Business Initiative Fund of Florida will receive $25,000 to help rebuild businesses and economic development in Flagler and Volusia counties. Heart of Florida United Way will also receive $25,000 for disaster relief efforts in central Florida. "After the debris is cleared and damage assessed, central Floridians will continue to feel the residual effects of Hurricane Matthew," said Robert H. (Bob) Brown, president and CEO of Heart of Florida United Way. "We are grateful to Duke Energy to be able to provide needed relief to those who suffered the most significant damage."